Satsang is a gathering of people in search of their True Nature. To sit with an awakened Master in Upanishad* is helping the disciple to experience The Self beyond the mind. It is here that many concepts, which have their roots in the mind, can be dropped and the True Self can be recognized and experienced. Satsang traditionally takes place as evening event for several hours. Every event is self-contained, it is not a course. The atmosphere is casual and natural and sometimes also ceremonial-devotional. Everyone can talk about everything. Phases of silence are alternate with phases question and answer. Nobody has to say something, but everybody can. The word satsang is describing a special spiritual line of the indian “Advaita-Vedanta” in the USA and Europe. It is a teacher-diciple line, which has its origin with Shri Ramana Maharshi and his diciple H.W.L. Poonja, called “Papaji”. Through again his diciple Gangaji, a US American woman, satsang first came to the USA, later also to Europe. Shantiji is already connected with the tradion of Advaita-Vedanta, through his birth in the indian family of the Chritrapur Saraswat Brahmans. Through the deeply enlightening meeting with Gangaji, he also became a satsang teacher in this unique line of Advaita Vedanta from Sri Ramana Maharshi. In Satsang, Shanti leads us to enquire into what is our True Being. The depth of the experiences at Satsang depends on the readiness and sincerity of the enquirer, on the one hand, on the spiritual presence of the teacher, on the other. While questions may be asked and words are spoken, a pre-verbal transmission is taking place and awakening-experiences can happen. Awakening to who we are is deeply liberating and the first step into a world beyond suffering. After a first awakening-experience, we can continue to deepen our awakening and actually begin “living in reality”. By attending Satsang on a regular basis awakening can be stabilized which will start penetrating and transforming our lives into wholesome, loving and joyful Beingness. 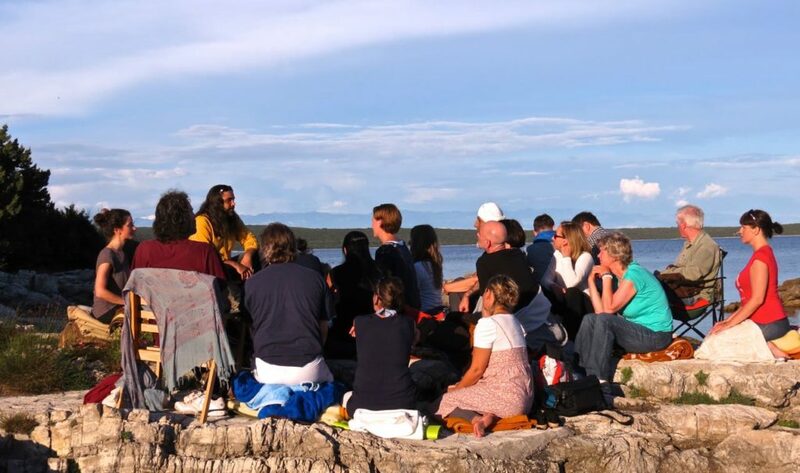 satsang: contents the two words sat (= truth, being) and sangha (= gathering), means the being together of people, who are searching or loving truth. upanishad: means literally- “sitting close to truth”, what means to sit close to a teacher/ guru. advaita vedanta: contains the words a-dvaita (= not dualism, non-duality) and vedanta (= end or completition of the Vedas). The Vedas are the holy scripts of the Hindus, which transfer goes back over 7000 years.